Today half the nation is mourning and half the nation is elated. Even though I did not vote for the President Elect, I refuse to believe we are going backward. If a farm girl from the middle of nowhere can follow her dreams and build a company and vote (we couldn’t do that in recent history, remember? ), America is still the place to be. As my sister put it, there is opposition in all things. If you are seeing the bad, there’s that much good out there as well. Go find it. And if you need, make pizza. This pizza crust is easy. It requires no rising and it’s happy simply being kneaded by hand. How cool is that? 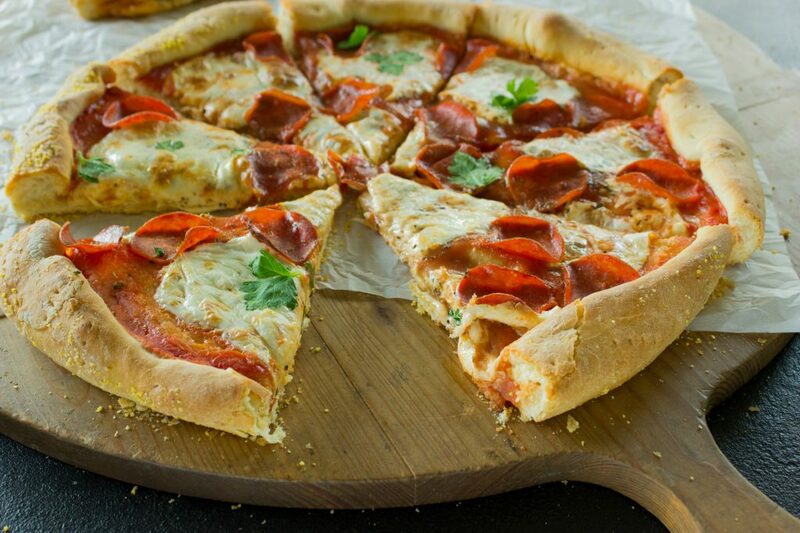 It makes a nice thin crust, and I can get 2 large pizza crusts from this recipe. My tip is to cook in a cast iron pizza dish. That’s where the real magic happens. Preheat oven to 400 degrees. In a mixing bowl, combine water, sugar, and yeast. Stir until the yeast is moist, then let it sit until the yeast foams. Add the rest of the ingredients, erring on the side of less flour. Stir together in the mixing bowl then knead for 5-10 minutes. Split the dough into two mounds. Roll the dough into a large circle. Sprinkle a thin layer of cornmeal over the surface of the pizza pan. Fold the dough in half and lift it onto the pizza pan. Unfold. The pizza dough should be slightly larger than your pan. Fold the crust inward to create a barrier for the contents of your pizza. Poke holes in the crust and precook 5-8 minutes without any toppings. Remove from the oven, then add toppings. Put back in the oven and cook an additional 10-20 minutes until the cheese is starting to brown and bubble.